Strawberry Reservoir is a large impoundment located in Wasatch County, 65 miles east of Utah's heavily populated Wasatch Front at approximately 7,602 feet in elevation. (Click here to view a map of Strawberry). The reservoir is contained largely within lands managed by the Uinta National Forest. Strawberry supports one of the west's leading cutthroat fisheries and is Utah's premier cold water fishery. 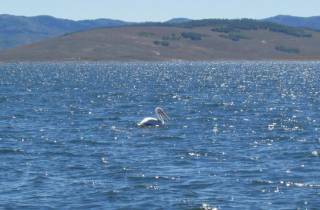 The reservoir typically	receives about the same number of angling trips as Lake Powell, which is more than 13 times	the size of Strawberry. Strawberry currently sustains about 1.5 million hours of fishing pressure every year (88 hours /acre/ year). Strawberry has developed the reputation for consistently producing large rainbow and cutthroat trout, and the 12.3-kg. (27-lb) cutthroat	taken at the reservoir in 1930 still stands as the official state record. 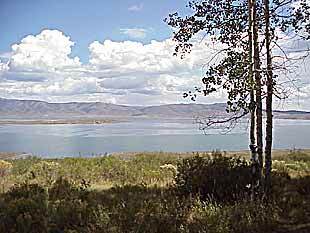 Strawberry Reservoir is Utah's most famous and popular trout fishing lake. Strawberry is managed by the Utah DWR by stocking sterile Rainbow Trout large enough to escape predation by the piscivorous native Cutthroat Trout. They also take the eggs of some spawning cutthroats and raise them in hatcheries, then return them to the reservoir as fry. Kokanee Salmon are also present in the lake, and are occasionally stocked as well. Strawberry Reservoir is located 23 miles southeast of Heber City, Utah on US Highway 40. Major improved access routes to the reservoir include the West Side Road [FS Road 131], Soldier Creek Marina road, and the Soldier Creek dam road. There are four paved boat ramps at the reservoir including Strawberry Bay Marina, Renegade, Soldier Creek Marina, and Aspen. All of these sites contain developed Forest Service campgrounds. The Strawberry Bay and Soldier Creek Recreation Complexes are full service developments which contain numerous campground loops, sanitary dump stations, day use areas, group pavilions, and marina stores. In addition, the Strawberry Bay Recreation area contains a restaurant and a full service lodge. There are a variety of additional day use developments around the reservoir at such sites as Haws Point, Mud Creek, Chicken Creek East and West, Soldier Creek Bay, and Soldier Creek Dam. The Forest Service operates a Visitor Information Center at the junction of US-40 and the West Side road. Two anglers enjoy their first time ice fishing at Strawberry. There is an egg-taking station that harvest both the cutthroat eggs and the kokanee salmon eggs when they spawn. Studies have shown that the success rate of taking eggs and raising them, then returning them to the reservoir is much higher than completely natural reproduction would be. The egg taking station is just off Hwy 40 and allows visitors to tour the facilities. Strawberry Reservoir contains four major fishing areas including the Strawberry Basin, Meadows Basin (sometimes referred to Indian Creek Bay), the Narrows, and Soldier Creek Basin. The Strawberry Basin encompasses the old 8,400-acre Strawberry Reservoir which was contained by the original Strawberry Dam and Indian Creek Dike. This is the largest of the four areas and comprises about 64 percent of the entire reservoir volume at high water. Most of the fishing pressure occurs in this area. The Meadows inundates a broad gently sloping valley of the lower Indian Creek Drainage, and is a good place to go fishing. It is located on the south end of the reservoir immediately south of the old Indian Creek Dike. Soldier Creek Basin overlies the old Soldier Creek Reservoir and contains Stinking Springs and Soldier Creek Bay. Soldier Creek is the deepest area of the reservoir, and is often a good place to find schools of kokanee in mid-summer. The Narrows area lies between Strawberry and Soldier Creek and occupies the narrow drainage channels of the Strawberry River and Indian Creek. A Pelican waits for a meal on Strawberry. Strawberry Valley provides a variety of fishing opportunities from catch and release fishing on reservoir tributaries to trophy cutthroat and rainbow trout fishing on the reservoir. The reservoir is open to fishing yearlong, and there are a variety of seasonal fishing opportunities as well. Most of the fishing pressure and catch occurs from boats. Shoreline fishing is best during the cooler seasons of spring and fall. January and February provide the best ice fishing success. Strawberry has also become a popular float tube destination. We often hear people talk about the 'good ole days' of fishing, back when you could catch tons of fish, and lots of bigs ones, and that sort of thing. Whether you enjoy flyfishing, trolling, float tubing, ice fishing or baitfishing from the bank, Those days are right now at Strawberry Reservoir! There has never been a better time to take the family or your fishing buddies out and go fishing at Strawberry. Thanks to the 'slot limit' now in place, there are more and bigger fish than ever before in this exceptional lake. No more than two fish may be cutthroat trout under 15 inches, and no more than one may be a cutthroat trout 22 inches or larger. All cutthroat trout between 15 and 22 inches must be immediately released. Anglers are encouraged to voluntarily release all cutthroat trout. Any trout with cutthroat markings is considered to be a cutthroat trout. It is illegal to fillet fish or to remove heads or tails from fish taken in waters such as Strawberry where size limits apply.